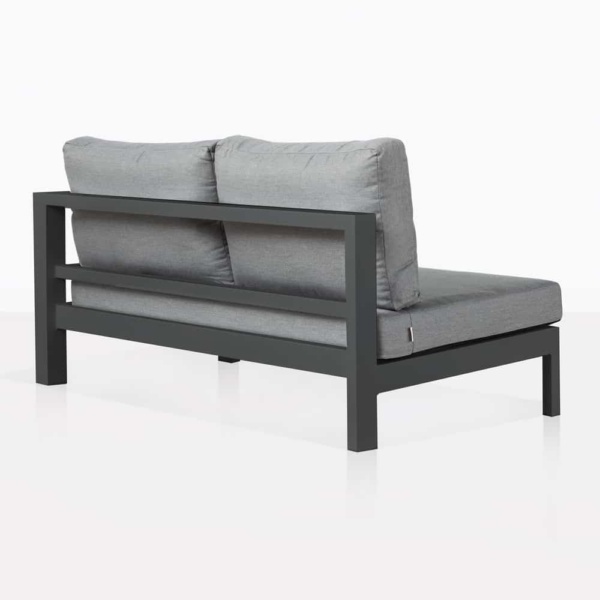 Get set to take a breath in beautiful, charming luxury with the Amazon Outdoor Sectional Left Arm with Coal Aluminium. This gorgeous modern chaise style piece, is part of the of the effortlessly chic Amazon Collection, a fabulous 8 piece strong range which features an amazing linear style in the dark grey powdered aluminium that is inherently modern, simple, and versatile. Whether you opt to have the gorgeous Amazon Left Arm on its own or as part of the wider Amazon Collection, you will be overjoyed to have this incredible Sofa in your outdoor area. Envisage a large verandah, space to burn, overlooking a grand view… you’re just waiting for a seating area to really take in all the glory of mother nature! Situate your Amazon Left Sectional against the end of your deck, with an Amazon Corner, and then stretched out with the wonderful Amazon 2 Seaters, and ended with an Amazon Right Arm Sectional… the perfect positioning for ultimate luxury. Perhaps you have a smaller area, ideal for this elegant 2 seater chaise Amazon Left Outdoor Sectional. 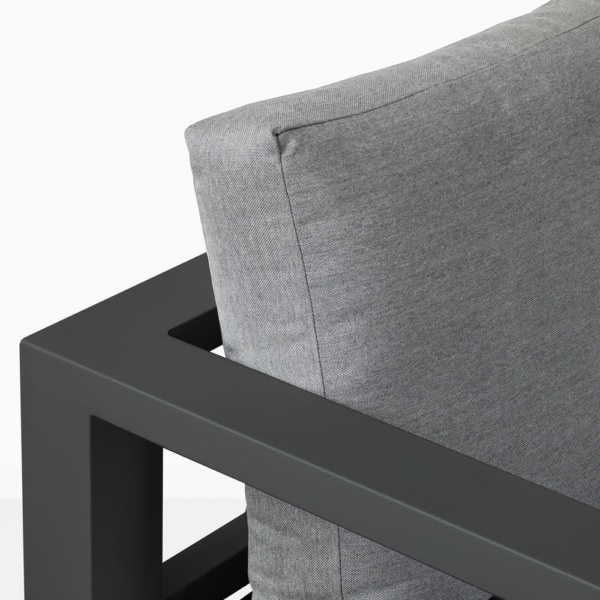 Place it with a couple of modular side tables on each end and sit back and unwind in the style and comfort you deserve. Built from incredible, robust powder coated aluminium in dashing coal, the Amazon Collection is premium quality and at wholesale prices! If that weren’t enough, we provide free Sunbrella® cushions, which are through-dyed, UV treated, look and feel great (as shown). So you can enjoy incredible high end furniutre, without the worry of excess maintenance. The Amazon Collection is bought piece by piece and is available in white as well as coal. You won’t regret the comfort of versatility and choice available in this stunning collection. 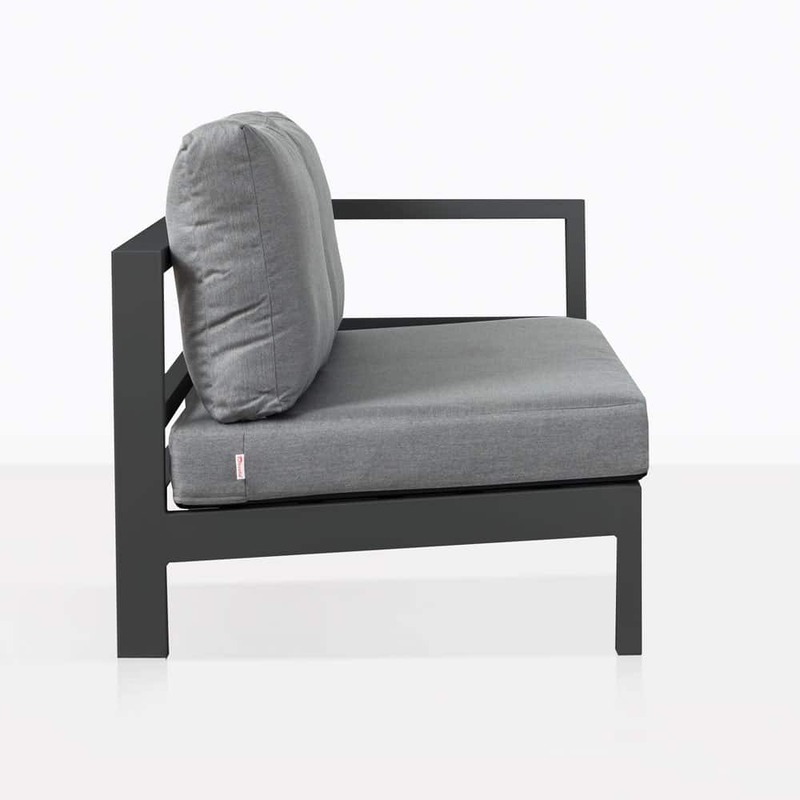 Design Warehouse has the largest array of stunning outdoor furniture. 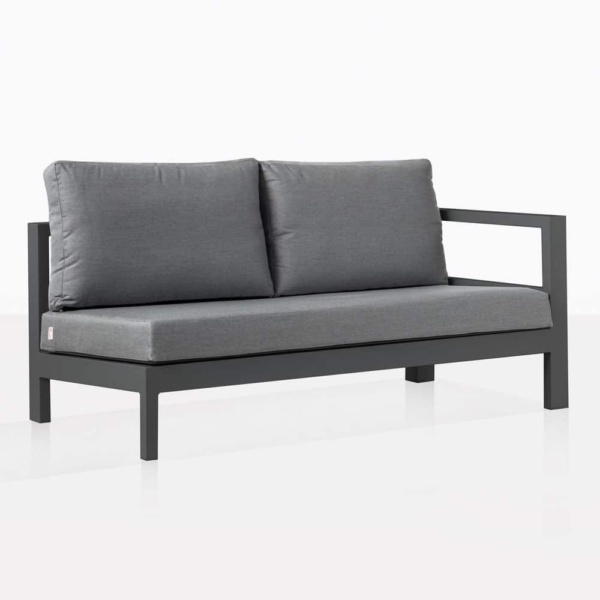 Call us today to order your very own Amazon Left Outdoor Sectional Sofa in Coal!